What are the most frequent distractions that you experience daily? If you’re like many workers, smartphones, social media, and small talk or gossip are frequent causes of interruptions and distractions at work. A recent study by RescueTime found that 35 percent of workers check email or instant messaging AT LEAST every 3 minutes throughout the day. That same study found that 40% of employees say they never get 30 minutes of uninterrupted work time. The reality is that workplace distractions are common. Today’s distractions may be primarily digital but interruptions have happened since the days of the cave dwellers. Udemy’s research asked employees what their employers can do to reduce workplace distractions. 40% said to allow flexible scheduling and remote options. 38% want employers to designate quiet zones. 31% want employers to define cultural norms regarding noise levels and interruptions. And, some distractions are unavoidable. If an important client wants a deliverable by the end of the day, all hands will probably be assigned to getting that task done. If a key project goes awry, all hands will probably be asked to help it get back on track. 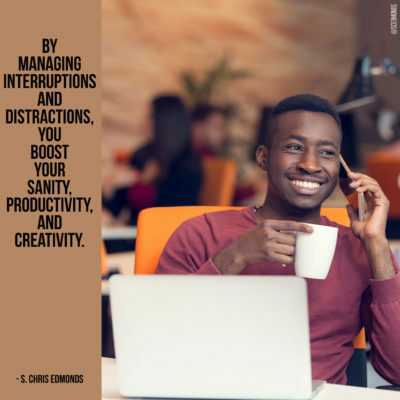 In today’s three-minute episode of my Culture Leadership Charge video series, I describe how to reduce distractions to increase your sanity, productivity, and creativity – and when when to embrace an important distraction. Photo © Adobe Stock – FS-Stock. All rights reserved. How well do you, your leaders, and your team members handle distractions in the work environment today? Share your insights on Twitter, Facebook, and LinkedIn.